Engelbert, the Software Engineering VP, sat quietly in his office pondering the current state of UberDenke’s next UDCRM release. Slowly he had realized the release wasn’t going to ship on time. There were many more errors than he planned for, and over half of the code had not even reached the testing group. The more he thought about it, the more he felt trapped. The more trapped he felt, the more he wanted out. The more he wanted out, the more he felt trapped. And around, and around his feelings traveled in a vicious circle of trapped and wanting out. But there wasn’t anyway out. Or was there? 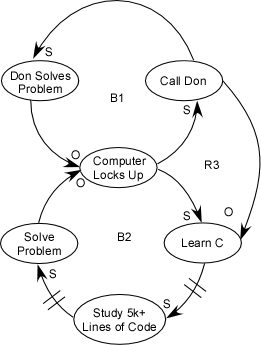 Engelbert’s thinking and actions have trapped him in a reinforcing feedback loop. His feelings are creating an emotional downward spiral that will continue until some system limit is encountered. The system limit may be the when he finally admits to others the release won’t ship on time. Perhaps his health (mental or physical) may break first. Or maybe he’ll change jobs. We can all sympathize with Engelbert’s plight, because at some time or another, we’ve all been caught like this–a trap artistically summarized by Jean Paul Sartre’s depressing play about three people trapped in Hell, No Exit. 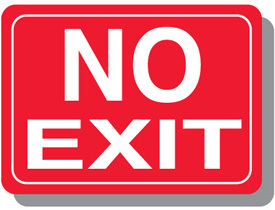 Engelbert set up his own No Exit hell right from the beginning, because he, like Sartre’s victims, had no exit strategy. An exit strategy is a planned set of activities to initiate when one party suspects that a relationship isn’t working, activities that should prevent the situation from becoming a hellish trap. The no-exit dynamic generally begins when two (or more) parties agree to work jointly on some project. Sometimes the agreement is not explicit, as often happens when the work of one party depends on another party’s output. This joint work could stem from a voluntary relationship (such as co-authoring articles) or perhaps from a management mandated decision. In Engelbert’s case, his manager told him to use a new process to build the next generation of their software product. The parties start merrily to work under the agreement, and all goes well for a while. Next, life happens. Perhaps the person with whom you agreed to write an article falls ill, changes jobs, or takes time away from the joint project to deal with pressing family problems. Perhaps the other team at work discovers the problem is more difficult to solve than anticipated. Possibly another higher priority project siphons manpower from their team. Or perhaps the dynamic starts up when the levels of commitment and interest are unbalanced, or when there is a different understanding of the agreement. It’s only happened one time. (Not noticing prior behavior on the part of either party). They’ve got a plausible story. (Just one more chance). Whatever the reason–and there are hundreds of variations–the slips soon become the norm, not the exception. Since the slips happen individually, separated by days or weeks, the cumulative effect isn’t noticed until it’s too late to do anything reasonable about the slips. The more we become accustomed to the slips, the more tolerant we become as new slips occur. It’s not that Engelbert is stupid. It’s just that he lacked foresight, or was too optimistic. If he had known when starting development that the project would slip several times, he could have planned differently. Failing to take early action sets the precedent for continuing failure to act. Failing to act causes negative feelings to accumulate. The negative feelings are there from the first slip, but they are ignored or suppressed until the accumulated value becomes greater than we can tolerate. When we finally surface the negative feelings, we feel trapped by our previous actions. We’ve become locked in the reinforcing feedback loop of simultaneously wanting out and feeling trapped. In this dynamic the system continues accumulating more negative feelings until the system experiences a catastrophic collapse. Engelbert may be fired, or quit, or get sick, or ship a system that drives his company out of business. So, what’s the solution? The first step to exiting the reinforcing feedback loop is to become congruent by balancing the factors of yourself, the other party or parties, and the context in which the dynamic is taking place. Most commonly, in this type of a feedback loop, the other becomes lost. As you try to cope with the situation, you start blaming the other person for the problem, and that only tightens the loop. Responding incongruently like this creates stress and does nothing to improve the situation or help find an exit from the loop. Changing how you see your contribution to the problem. Determining why you feel like you’re trapped. Obtaining a better understanding of what you heard during the “agreement” process. 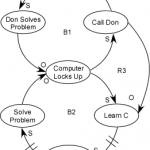 Another exit option is to become centered, congruent and work on changing the loop dynamics. The key here is to recognize the No Exit dynamic early, and take corrective action quickly. Your plans and strategies must be flexible. While the goal can be constant (exiting the loop), life continually changes, so fixed plans inevitably become obsolete or, even worse, counter-productive. Next time, Engelbert should consider prevention interventions. 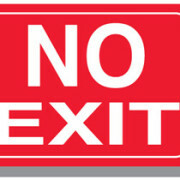 Prevention interventions can be used to prevent the No Exit dynamic from happening in the first place. Or if it starts anyway, they provide an agreement among the parties as to how to handle it–if you like, a meta-agreement, or agreement on the limits of our agreement and what we’ll do when we reach them. In a crisis, it’s much easier to stop and think if you have provided time in your plan for stopping to think. If you haven’t, one party will say, “Here you tell me that we’re behind schedule, but you’re adding this thinking-bit to the schedule. That doesn’t make sense.” With that easy dismissal, everyone quickly hurries back to their unproductive panic. Better understanding and more explicit statement of each party’s expectations, along with a process by which expectations can be modified along with the plans that were based on them. 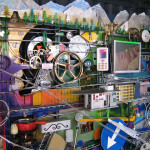 A well-designed system will set some limits at the beginning, limits that are not vulnerable to a buildup of tolerance. Know when to enter (never do unless you’re asked for help, though you can encourage the parties to ask you). Prevent damage (whatever that is) to others. Decide it’s not your problem and walk away, letting the nature of the no-exit loop take its course. Avoid creating addiction (co-dependent) dynamics. Avoid using fixes that accentuate the dynamics, unless you want to make it worse so it will crash more quickly or lead to enough pain that the parties will work out their own solution. Be careful not to prevent natural learning. Look for interventions that remove barriers and/or increase resource states. First exit is when participants realize how much pain the feedback loop is causing and figure out a way to break out for themselves. The second exit is out of the situation (as when the parties concur that the agreement has failed). This may lead to a new agreement, or an exit agreement where they continue the relationship with each other. The third exit is where one party opts out of the system by ending the relationship. How Did This Happen? Shifting the Burden – Whose Monkey is it?